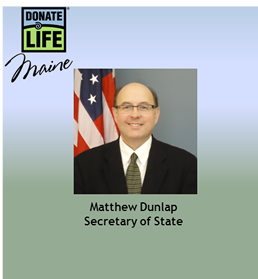 Welcome to the Secretary of State's Donate Life organ donation website. On this site, you will find a wealth of interesting information about organ donation, and in just a few clicks, you can sign up to become an organ donor. If you are a Maine resident, 16 years of age or older, you can help save lives by adding your name to the Maine Organ Donor Registry. It’s free and easy – taking just a couple of minutes – to sign up online with the Secretary of State’s Organ Donor Registry Online Service. If you’re not sure if you’re a donor, it’s easy to check online using the same service. Or, if one prefer, you can also sign up by visiting a Bureau of Motor Vehicles Branch Office. Your decision to become an organ donor is an important one. Just one organ and tissue donor can save or enhance the lives of more than 50 people. Tens of thousands of lives are saved and improved every year, because of ordinary people who took the simple, but heroic, step of adding their names to an organ donor registry. BUT, there remains a large unmet need for organ donation. In the United States, there are more than 107,000 people waiting for an organ. Tragically, on average, 18 people die every day while waiting for transplants. Fortunately, you can help prevent those tragedies by considering organ donation and encouraging your family and friend to consider becoming a donor as well. Laws & Links page to review Federal and State laws and connect to other donate life sites. Sign Up Now. It's easy!